For a group of students with a passion for e-sports, winning a medal at an international competition can be one of the best memories of university life. It was such a moment for a team of five UTAR students from Kampar Campus when they were announced as silver medallists in the ASEAN Games for E-Sports 2016 (AGES), in the game of DOTA 2 under the category of University Open held at Mid Valley Megamall in Kuala Lumpur from 27 to 29 May 2016. AGES 2016, organised by Platinum Eden Sdn Bhd and supported by Esports Malaysia, had attracted a total of 51 teams from eight countries. Combining their aptitude, determination, and passion, the team bested 49 other teams and bagged RM8,675 for the second prize. The team comprised Marketing student Cheong Tzun Yin, Advertising student Kok Liang Hua, Computer Engineering student Chai Mun Hong, Environmental Engineering student Tay Kok Sheng, and Accounting student Ang Boon Liang. 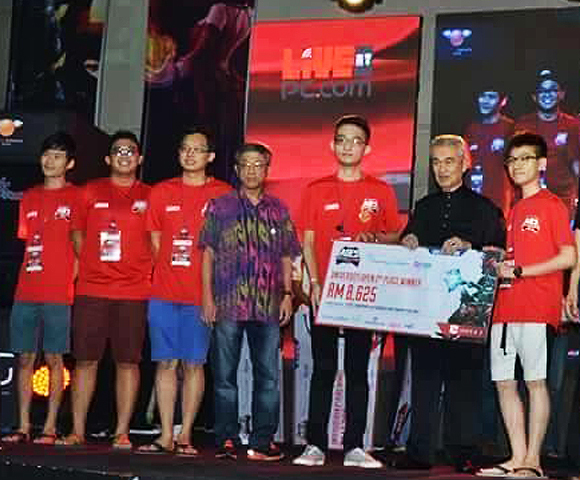 AGES 2016 was the brainchild of chairman and founder of Esports Malaysia (eSM) Dato’ Latt Shariman. The tournament was open to all ASEAN countries and aimed to unite electronic sports enthusiasts from all walks of life to compete and strive further in electronic sports. The three-day event kicked off with the Malaysian Finals – Road to AGES 2016 on 27 May, which then led to the ASEAN Round of qualifiers on 28 May, and followed by the AGES Grand Finals on 29 May. The three electronic games that were played at AGES 2016 were DOTA 2, Counter Strike: Global Offensive (CS: GO), and FIFA 16. The participating countries were Thailand, Singapore, Philippines, Indonesia, Vietnam, Cambodia, and Malaysia.